I value very much the code I write and I want to make it the best code I'm able to write from the start. When I don't know how to transform some idea into code I go to GitHub and search for code. 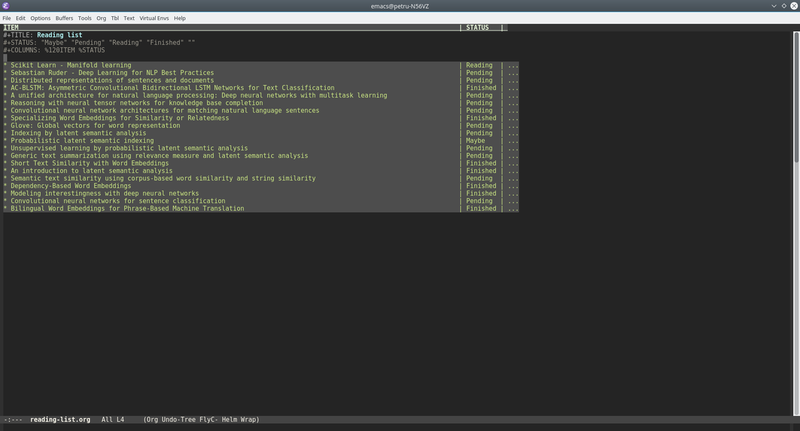 Example: my Emacs config. Looking back at 2018 I can say for sure that it has been a busy and thankfully fruitfull year for me; I have managed to juggle work and community tasks while also spending time with my family. Being known as a Big Data enthusiast at my job, I was asked if I could give a presentation on Big Data. I was more than happy to do so and this way I got a glimpse at how it feels when giving a lecture - the presentation was scheduled in one of the big lecture rooms at the Faculty Of Economics and Business Administration; can't say I didn't liked the feeling. The slides are available from my OneDrive account. A few weeks later I was hosting a tutorial on Artificial Neural Networks at Alecu Russo State University from Bălți, Moldova. The tutorial was the first event at the International Conference on Mathematics, Informatics and Information Technologies and also my first academic talk. In june we celebrated one year since the Iași AI community was created with a cover story in PIN Magazine about Artificial Intelligence. I authored one of the cover story articles in which I expressed my opinion about how Artificial Intelligence, although it had tremendous success lately, it's still at the beginning of its evolution and we, humans, must set our expectations accordingly but still expect that AI will change our lives. You can read the whole article here. At the end of August and in the beginning of October I co-hosted two TensorFlow worksops together with Ciprian Tălmăcel organized by the Iași AI community. This was my debut as a presenter within the community and proved to be a great experience and success. I had the opportunity to learn a lot from Ciprian and also to improve my skills through the feedback given by attendees. 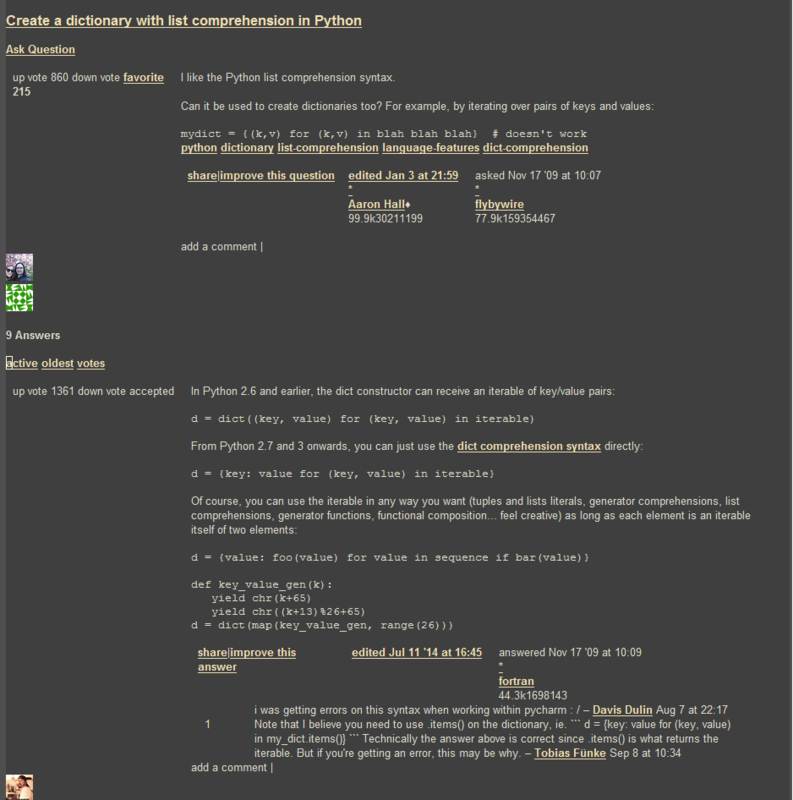 You can find the Jupyter Notebooks for the workshop in the dedicated Github repository. A month later, in November, was my second appearance within the Iași AI community, this time with a presentation about Recurrent Neural Networks. The main focus of a presentation was how simple the code can be if you possess the theoretical background and how you can actually learn (to some extent) the theory behind just looking at the implementation. I have published the slides, the code and the LaTeX code for the presentation in a dedicated Github repository. Gladly, my activity within Iași AI community did not end with the RNN presentation; later on, I helped organize the AI opportunities panel which was the last official event of the community for 2018. In parallel we started puring more effort into implementing an Open Data Hub initiative for Iași; this however is a project for the upcomming year(s). Last but not least, I got promoted at work. In April I switched projects at work and took the switch as an opportunity to affirm myself. The efforts I've put into building solid and scalable products and also improving the existing ones have been observed by the management team and at the end of the year I got promoted to the role of Technical Lead. It's already the start of 2019 and I'm excited to what's comming ahead - the Open Data Hub, the newly opened opportunities at work, the upcomming projects in academia and many more I don't know of. What I do know is that I will do my best to do even better in 2019. 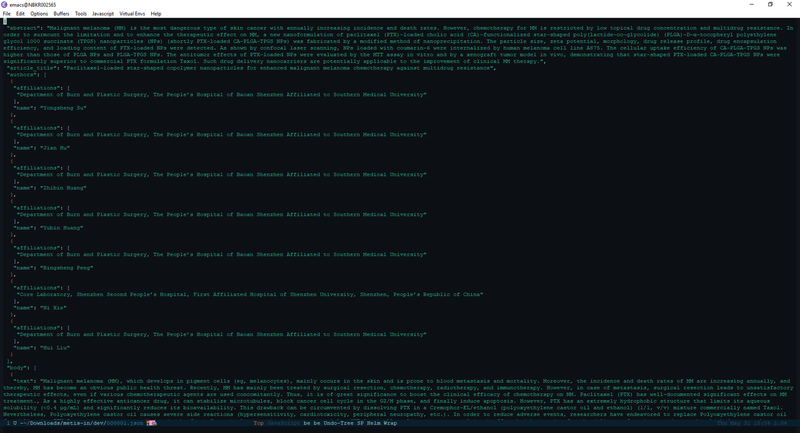 Due to the lack of human resources in a research project I'm involved the team decided to take upon itself the semantic comparison of 3000 pairs of papers from the medical domain. Since we also want to do at least some cross-validation we decided that each member of the team should compare 2000 pairs of publications so that each pair will be compared by two out of three persons from the team. So we split the 3000 publication pairs into 3 sets which were saved into csv files with the following structure: file1, file2, similarity_score; where file1 and file2 are the names of the files and similarity_score is to be filled with the semantic similarity score. Although this workflow seems quite laborious due to so many steps I've gotten used quite rapidly (from the second pair) to it and managed to form some sort of temporary muscle memory for opening files in the sense that I was doing that on full auto-pilot, without thinking that I'm opening files. However, there was a problem with this workflow: the directory in which the files to be compared are located contains around 100 K such json files and on my 5400 RPM hard-disk it took what seemed like forever to scan the directory when pressing C-x C-f in order to give me the benefit of autocompletion which I did not need because I already knew the files names. So basically for each pair of publications I was stuck waiting twice for the directory to be scanned. And then I got an idea: I already knew the file names; the directory containing them is the same so wouldn't it be faster to send the full path (obtained by concatenating file name and directory path) to find-file function instead of waiting for a directory scan? 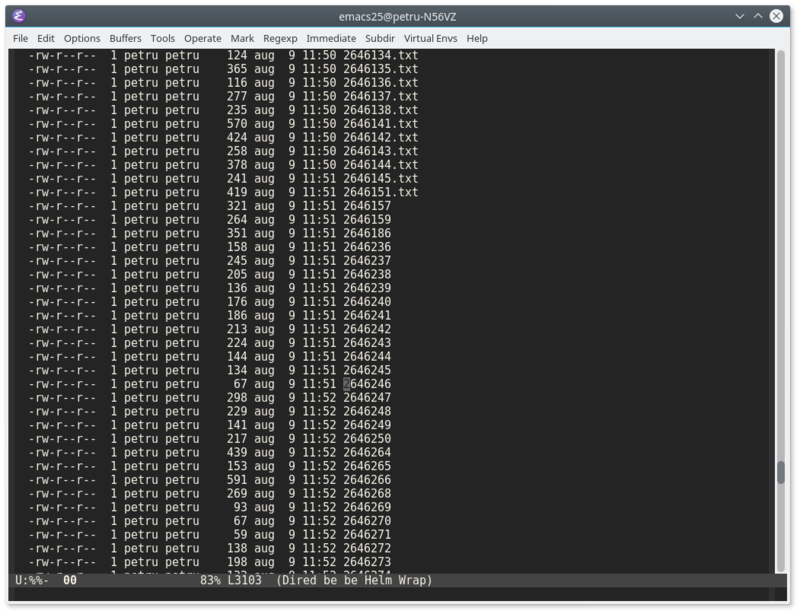 I switched to the *scratch* buffer and evaluated a find-file call with the full path of a file and of course, the file was loaded instantly. So I decided to take it a bit further: Can't I, while on a line in left window open the files on that line in the other two windows? Of course I can because Emacs is awesome. 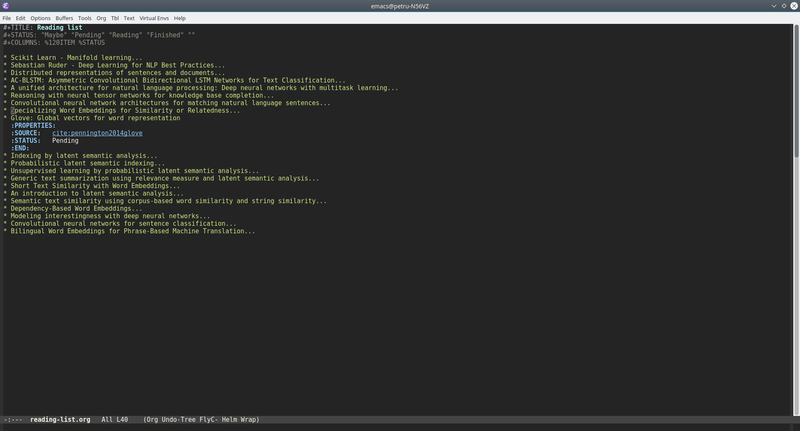 All I need to do is write some code lisp code that will do what I want. This function moves the point to the beginning of the line by calling (beginning-of-visual-line) then saves the position in a local variable start and moves to the end of the line via a call to (end-of-visual-line). In the end it returns the substring which is between start position and the position returned by (point) function. And that's it. After calling eval on the functions above I have an automated workflow. 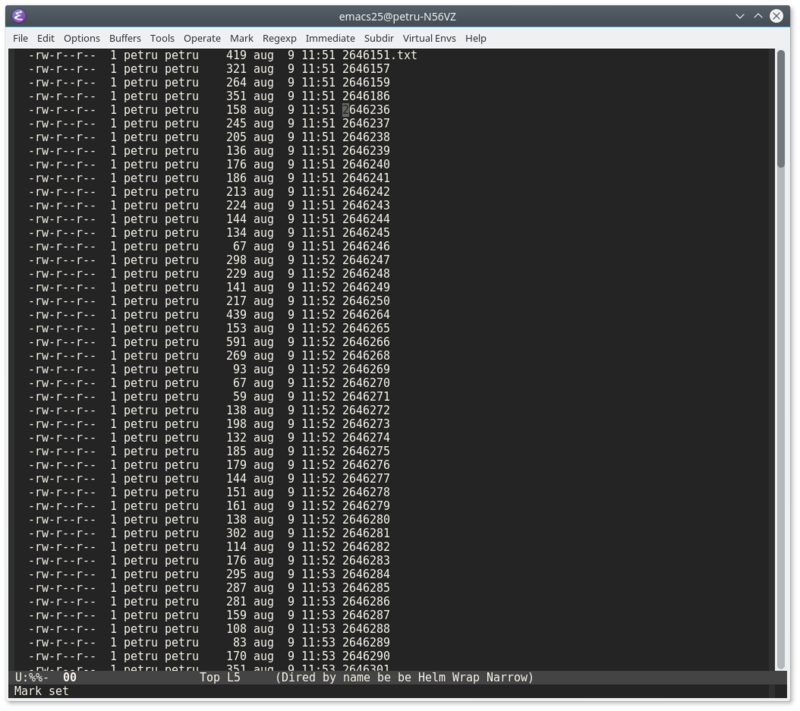 Now, to compare two files, I just navigate to a line in the csv file and from there type M-x compare-publications. The only thing left to do manually (beside the comparison itself) is to press the key for the similarity_score of files from that line. 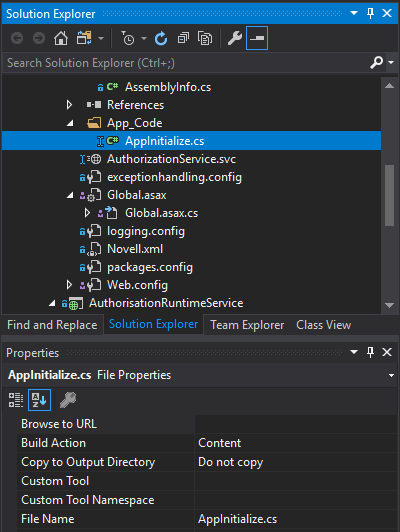 When hosting WCF Services in WAS (Windows Activation Service), you are not given an opportunity to build your container in the ApplicationStart event defined in your Global.asax because WAS doesn’t use the standard ASP.NET pipeline. ORM frameworks are a great tool especially for junior developers because they allow bluring the line between the application logic and the data it crunches. Except that the aforementioned line blurring advantage may become a real production issue if not taken in consideration when writing the code. where OrderItem holds the data about an ordered item. Of course, since we're using an ORM framework, the classes used by the repositories - Customer, CustomerOrder and Item - are mapped to database tables. And why wouldn't they? It seems the most straightforward transposition of the requirements defined above. The code behaves as expected in both Dev and QA environments and afterwards it's promoted to production where lies a database with hundreds of thousands of rows in the Items table. There also, the behavior is as expected until one day an eager customer wants to buy 980 distinct items (because why not?). What happens with the code above? It still works well but the database command times out and the customer cannot place a significant order. So what is the problem? Why it times out? Well, because the aforementioned line between application logic and database is blurred enough for the iterative paradigm to creep into the set-based one. In the SQL community this paradigm creep has a name - Row By Agonizing Row. To put it in the context of the example above - it takes more time to do 980 pairs of SELECT and UPDATE operations than to do one SELECT which returns 980 rows followed by one UPDATE which alters 980 rows. So, let's switch the paradigm and start working with collections in our code to minimize the number of operations in the database. The first thing to do is to load all items in bulk instead of loading them one by one. This will reduce the number of SELECT operations from 980 to 1 (a whooping 50% of the number of operations). We still need to update the stock counts for each item individually because the ORM framework doesn't know how to translate the changes for each item into a single UPDATE statement but considering that we've halved the total number of operations let's give this approach a try shall we? This will solve the problem with the timeout but will create another one - useless load on the system. The code loads 980 rows from the database but only uses two attributes of each row - Id and Barcode. We might say that this can be solved by projecting an Item into a tuple of <Barcode, Id> but this would be a partial solution because we can still place a great burden on system memory by sending an request of 10k items. Also, there are still 980 UPDATE statements that need to be executed which is still a lot. The best approach to this is to not load any data at all from the database and to do the processing as close to the actual data as possible. And how can we do that? Exactly - with stored procedures. Now, of course in real life situations there won't be a customer that orders almost 1000 items with a single order and the second approach (bulk load items and iterate the collection) will do just fine. The important thing to keep in mind in such cases is the need to switch from a procedural mindset to a set-based one thus pruning this phenomenon of paradigm creep which can become a full-blown RBAR processing. Since I've started to use Emacs more and more I started wondering whether I can use org-mode to keep a reading list/bibliography? A quick search led me to this blog post where the author was presenting his setup for the same thing. However, after reading into the post I saw that the author uses a combination of tasks and a reading list which requires custom code to be executed and is too complex for my needs. should allow me to change the status of an entry. 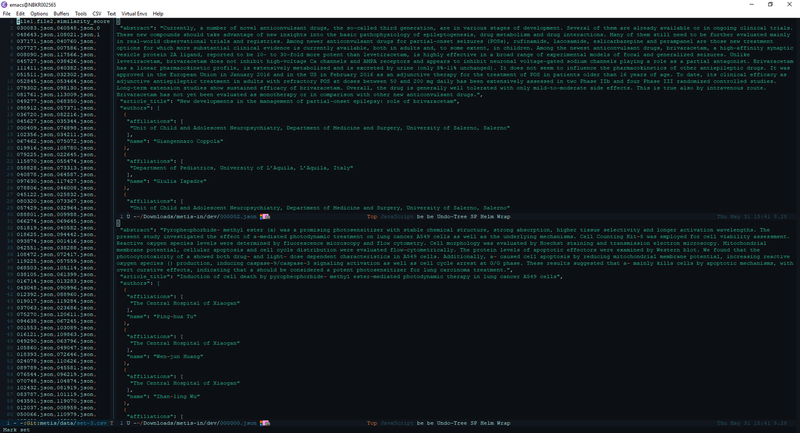 I did however liked the idea of using references to the papers being read and since I recently saw a YouTube video presenting org-ref I thought I should give it a try. To handle the availability part I decided to use Dropbox which is also suggested by org-ref. #+STATUS: "Maybe" "Pending" "Reading" "Finished" ""
Finished - the entries that are already read. If you know the citation key (le2014distributed in the example above) then you can write directly cite:le2014distributed; otherwise, leave the value for Source empty and put the cursor after the property declaration. Then, press C-c ] and select the entry from the reference list. To switch to column view, place the cursor outside the headings and press C-c C-x C-c (or M-x org-columns). The list should look like the image below: If your cursor was on a heading when pressing C-c C-x C-c (invoking org-columns) then the column view will be activated only for the selected heading. To exit column view position the cursor on a heading that is currently in column view and press q.